The Royal College of Radiologists has recently made public an analysis of the FRCR examination based on the Spring 2014 examination. This is a detailed analysis of all components of the FRCR examination. As expected the data is analysed with great statistical detail. Although this is a necessarily comprehensive approach for the RCR a significant amount of key derivable data and conclusions are missed by such an analysis. It also allows us externally to lift up the veil of the exam and explore ways to improve our performance. Point 14. The college likely fiddles the results. *The college reviews the value of every case in the rapid reporting packs to the total discriminatory score. 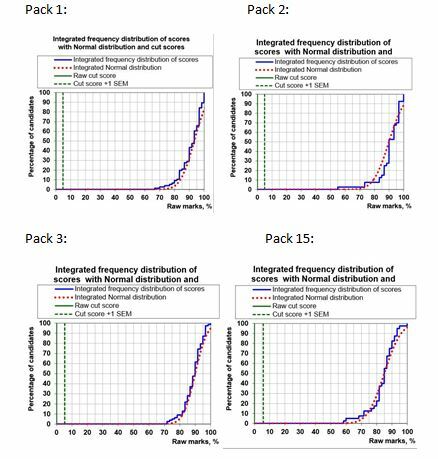 However, it would appear from the data presented above that there is considerable variation in the raw scores achieved between different packs. I would suspect that there is insufficient difference in the candidates in each pool although it is possible that this is a contributory factor. Overall though I would suspect that this means the college then has to apply some normalising factor converting the raw score to the closed marking scoring system to ensure fairness. Otherwise in some data sets the number achieving a ≥27/30 is too variable between 25% and 72%. I do not know this for certain but it would also explain the absence of cut marks/pass scores on the raw data provided as well as the absence of curves related to converted scores.